I know, I know. It seems crazy for a student at a Christian college to read their Bible, but hear me out: you need Jesus. People frequently tell me that they feel distant from God, that they don’t know what His plan for them is, that they feel discouraged, that they feel worn down, etc. The list goes on and on, but the Bible has a passage for each and every one of those things. I constantly hear people asking for advice about what they should do next in their life, about relationships, about changing their major, and so much more. It seems like people ask the people around them for advice, but they save prayer as a last resort. In other words, we tend to wait to ask the God of the universe -the one that actually has the answers- until all of our other resources have run dry. Does anyone else see a problem with that? We cannot claim to be Christians – to have a relationship with the one true God- if we never even speak to Him. That’s not how relationships work. Talk to God throughout the day, not just at mealtimes or before you go to sleep. He deserves so much more than that. No, I don’t mean just go to chapel. I mean actually be present at chapel. There is a big difference between begrudgingly sitting in Pardington just to fulfill your chapel requirement and sitting and worshiping with an open heart and mind. You have to be there anyway, so why not get something out of those 27 hours? You chose a Christian college, and hopefully that was because you wanted to grow in your faith. So take the opportunity to do so. Whether it’s a small group, a club, or your friends regularly getting together every week, find a group of people to connect with. 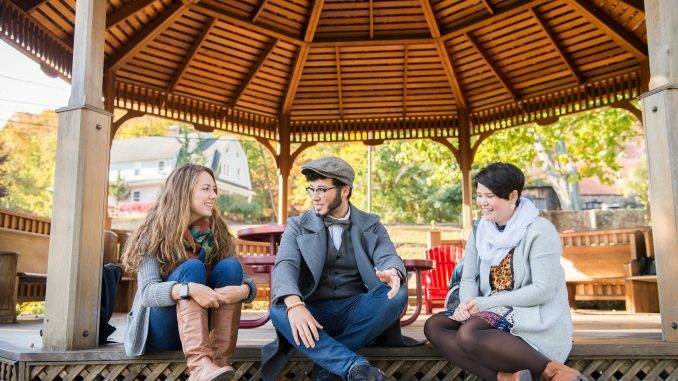 You can also think outside of campus; there are a lot of opportunities in the Rockland community as well (some of which could also count towards your 30-hour community service requirement, education majors). Most people’s stories from their college years aren’t about them sitting in Global Literature II twice a week, but about the experiences they had and the relationships that they built during those four years. That’s because college isn’t just about classes. It’s about community. While you might need to stay up until 2 or 3am every so often to finish an assignment, don’t make a habit of it. Going to bed and waking up around the same time each day will help you to fall asleep and stay asleep, leaving you more rested. I know we all love naps, but they actually interfere with our body’s natural sleep cycle, which can make you feel more tired in the long run. So, rely more on a full night’s sleep instead of a nap before your evening class. You’re in college, and your metabolism probably won’t be this good again, so eat that cookie. But don’t only eat cookies. You’re a big kid now, and it’s your responsibility to make sure you eat a [somewhat] balanced diet. Put a few green things on your plate. They won’t kill you, I promise. And make sure you’re getting enough protein. It’s very easy to carb-load in our cafeteria, but make sure you add some protein to your meal, and you can do that by adding some rotisserie chicken or black/kidney/garbanzo beans to your plate. Your stomach will thank you later, as protein makes you feel full for longer. We all say that we’re going to stop procrastinating, but it never happens. I would know; I’ve been a procrastinator all of my life. One thing I’ve done to help me get on track with my time management is to make a To-Do list for each day. It’s easy to get lost in a sea of syllabi and due dates, so I’ve found it helpful to break it down into what I need to do each day of the week, and that way everything gets done in a timely fashion. It helps me to set attainable goals and feel like I’m actually getting something done instead of drowning in assignments.